It’s such an honour when couples have us spend the day with them when everything else is otherwise very intimate. Kelsie and Scott had a Lundbreck ranch outdoor wedding ceremony at his parents’ place and planned a low key event for their small but important guest list. To embrace the ranch theme, Kelsie wore a beautiful summer dress and cowboy boots and they used their vintage pickup truck both for photos and transportation. After their ceremony overlooking the mountains, we travelled around the area making stops at Lundbreck Falls, the Burmis Tree, and Hillcrest for portraits. 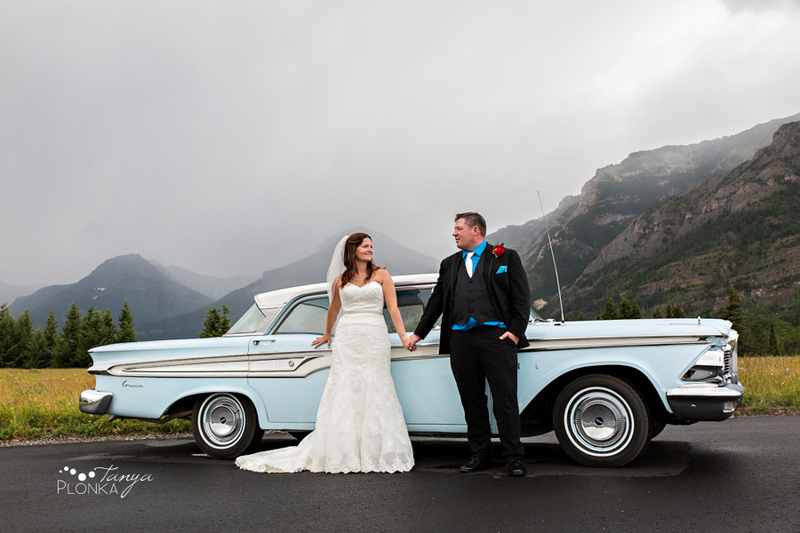 This gave Kelsie and Scott tons of private time during driving to spend with each other before rejoining their friends and family for their dinner reception in Waterton. Everything came together so beautifully for Jessica and Jordan’s Waterton Community Hall outdoor wedding ceremony! 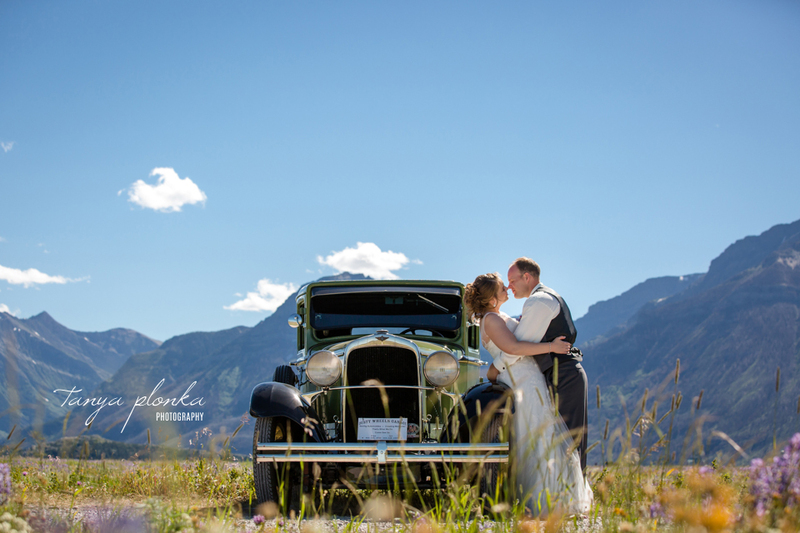 The couple chose Waterton as their wedding destination after falling in love with the beauty of the national park. The fire damage hit the treeline after they had already set their date, and construction near their wedding venue in the weeks leading up to the date had them worried. It’s almost as though the town finished all the construction just for them! All worries melted away as they were met with a beautiful, sunny day. Even the wild flowers were still in bloom and matched their purple wedding colours. Jessica and Jordan incorporated so many fun details into their wedding day! 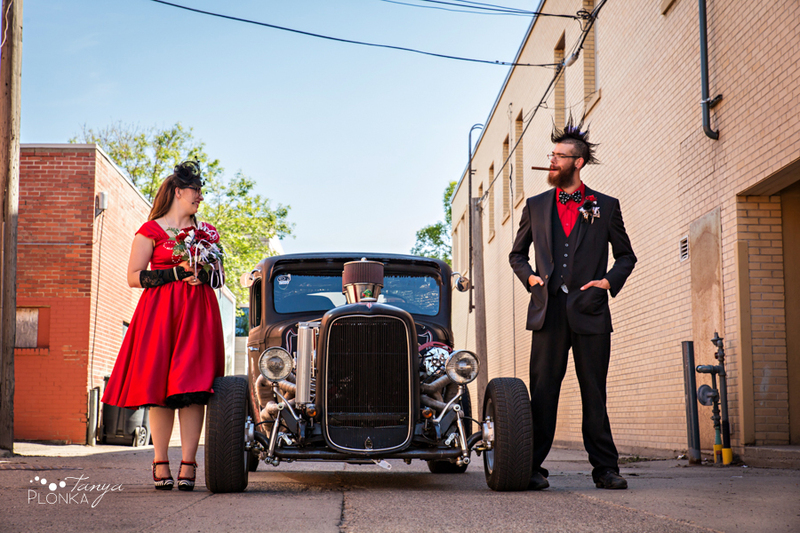 They had enough vintage cars to go around that no one in the wedding party had to go in a boring modern ride. Their two adorable dogs also joined in some of the festivities. They and their wedding party had so much fun cruising around the town. We had such a blast with them! Adrienne and Shawn held a romantic Waterton Bayshore Inn wedding ceremony in the afternoon along the lake. This beautiful day was an official joining of their families, though they’ve taken on each other’s children as their own for quite some time now! The couple made sure their family played an important role throughout the wedding day. Each of their mothers signed the marriage register, the wedding party was made up entirely of their children, and throughout the day they were chauffeured by Adrienne’s father in a light blue vintage Corsair car. The car, by the way, was gorgeous, and a perfect match for something old, borrowed, and blue! It was amazing to watch how in love they are. Shawn could barely fight back tears as he watched Adrienne walk down the aisle and spoke of how meeting her was like a fairy tale. Adrienne exudes kindness and caring when she is near him. It was such a beautiful day for their outdoor ceremony at Gyro Park with lots of sun and not a hint of wind. They made sure to include their three dogs in the ceremony and family photos, who were on their mostly best behavior for the day (there was just one blanket that was peed on!). Tony and Katie’s friends were as silly as they are and so much fun to spend the day with. 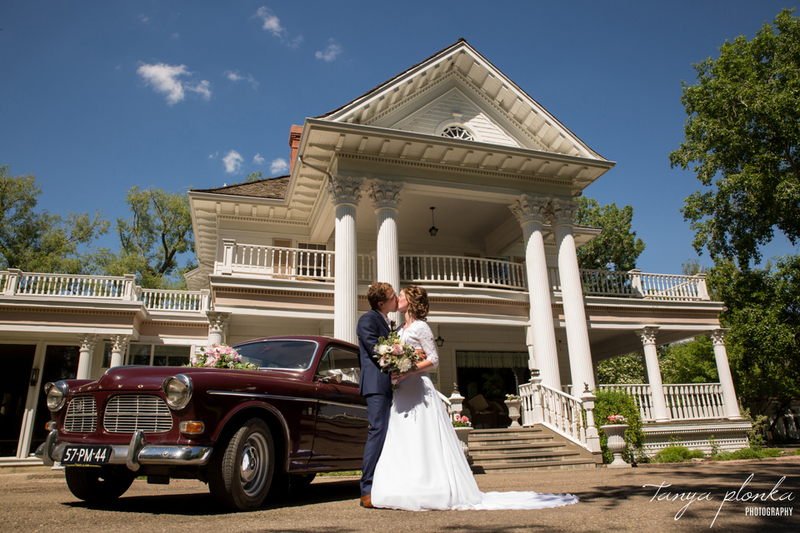 We even had a few extra friends follow us with their amazing classic cars (also matching the wedding color scheme), which added so much to the photos.